When conservative Anglicans met in Jerusalem last week, forming "a fellowship of confessing Anglicans", the implication seemed to be that anyone who shared their concerns about the erosion of traditional values would wish to join them. But the Bishop of Durham, Tom Wright, is a senior evangelical bishop - and he is fiercely critical of their approach. He shares many of the concerns expressed at the Global Anglican Future Conference (Gafcon) - but he is critical of the new movement's proposed solutions to current disunity within the Anglican Communion. Speaking on the World at One on BBC Radio 4, Bishop Wright dismissed plans to form a self-appointed council of conservative national church leaders opposed to active homosexuality. He said: "To be told that I now need to be authorised or validated by a group of primates somewhere else, who come in and tell me which doctrines I should sign up to, is not only ridiculous, it's deeply offensive". He said that the idea that those who were part of the new movement had a monopoly on Biblical truth was "a kind of bullying". 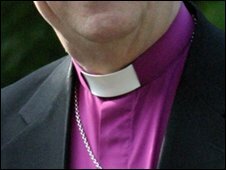 The bishop also said that among evangelical bishops in the Church of England, "the great majority would not have gone to Gafcon, didn't go, and remain deeply worried about it". His remarks are significant because Dr Wright is a senior evangelical leader who commands international respect as a teacher and Biblical theologian. He remains a key figure in the Anglican Communion's own attempts to safeguard unity: he was one of the authors of the 2004 Windsor Report, which proposed a "covenant" which member churches of the communion would join. His intervention underlines the fact that this dispute is not simply one between liberals and conservatives. Even among those fiercely opposed to the ordination of gay bishops, there are substantial divisions.